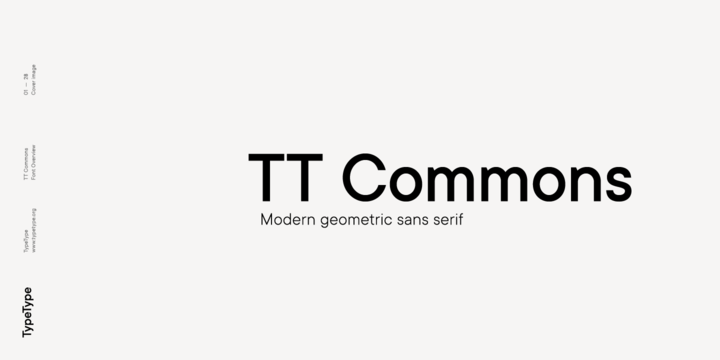 TT Commons is a geometric grotesk typeface created by Pavel Emelyanov together with Ivan Gladkikh & TypeType Team and published by TypeType which is available in 9 weights (from Thin to Black) and italics, a wide range of OpenType features and more than 70 language support. It includes a hinting option for all typefaces and it has a lot of tools for working with numbers including tabular and oldstyle figures, superscripts, scientific inferiors, numerators, denominators and fractions. Also features the symbols for most popular currencies. It contains a set of figures in circles, inverse versions and arrows for quick numeration and navigation in texts and diagrams, The font offers a moderate set of stylistic alternates with more humanist characters. This sans serif typeface is ideal for editorial use, display, logo, headline, magazine, newspaper, packaging, poster, text and so on. Enjoy! Price: starting from $49,00 for one font to $196,00 for all 18 fonts. A font description published on Friday, March 23rd, 2018 in Fonts, Ivan Gladkikh, Pavel Emelyanov, TypeType, TypeType Team by Alexandra that has 3,173 views.